Fun Fact About Me: I was born 2 weeks late, and I've been late for everything since. Parties, exams... it wouldn't surprise me if the hearse blows a tyre and I'm late to my own funeral. I needed to kick my timekeeping into touch, and I began to think that a gorgeous watch could be the key to changing my ways. 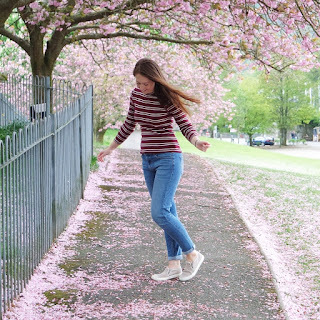 Bradburys of Halifax reached out to me and I soon found Olivia Burton amongst the designer brands they stock online and in their boutique store in Halifax, West Yorkshire. Straight away their banners showed me that they offer Michael Kors, Folli Follie, and Coeur de lion jewellery, but I knew Olivia was the one for me. Although there were leather, vegan leather, and even velvet straps to choose from, I decided it was best to go for something sturdy that my clumsy self couldn't ruin. The filters on the site made it easy to find rose gold watches with metal straps, and within seconds I was staring, starry-eyed, at the array. 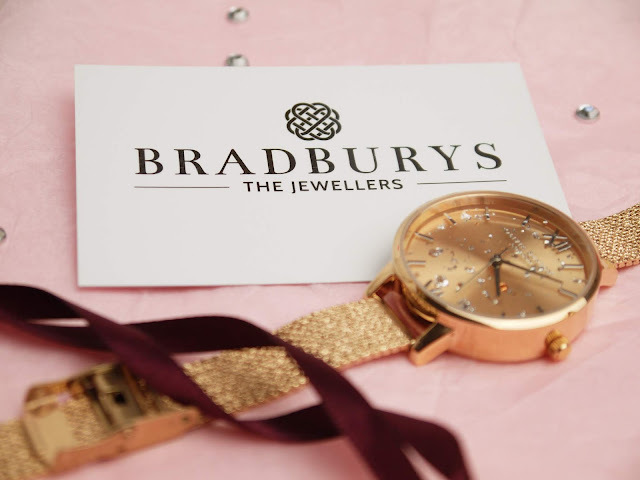 I was torn between the Black Lace and Celestial Demi Dial models, and I was pleased to see that both had the same price at Bradbury's Online as on the brand's website, so you can support an independent, family run business without spending a penny more. Fast forward to a few days later, when the postman brought my parcel. I was excited to rip into it, and rip I did! The little box was packed tightly with bubblewrap so there were no gaps, meaning my watch stayed so snug and secure, it could have survived being catapulted through my chimney to reach me. Inside, nestled under the bubbles and black tissue paper, was a box beautifully wrapped in rose gold paper and tied with a purple ribbon. It made opening my Celestial watch an even more exciting experience, and I love that Bradburys used rose gold paper to add that luxe metallic touch, tying in with their wares. With Christmas around the corner it's nice to know that you can lessen the load and order a gift that arrives ready to give to your lucky recipient. In fact, I might send all my presents to them- you can see from my attempt at rewrapping in these photos that I could certainly do with their help! 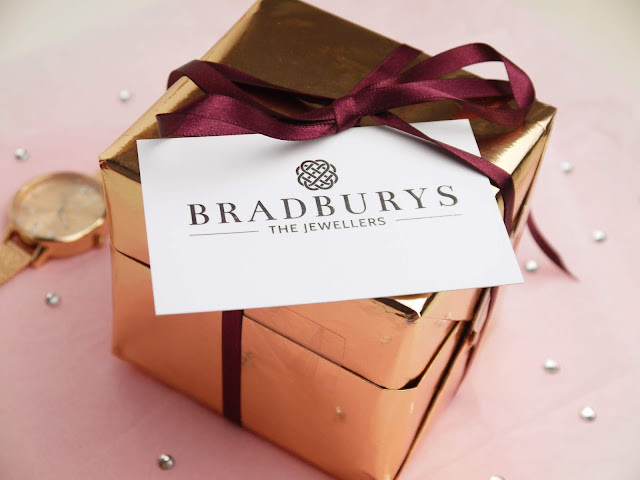 Alongside perfect packages, Bradburys Online can help make the festive season fairer to your wallet, too, with free delivery over £95, and finance available for purchases over £250. You lucky lot can also take 15% off using the code Blogger102 until 22.11.2018! 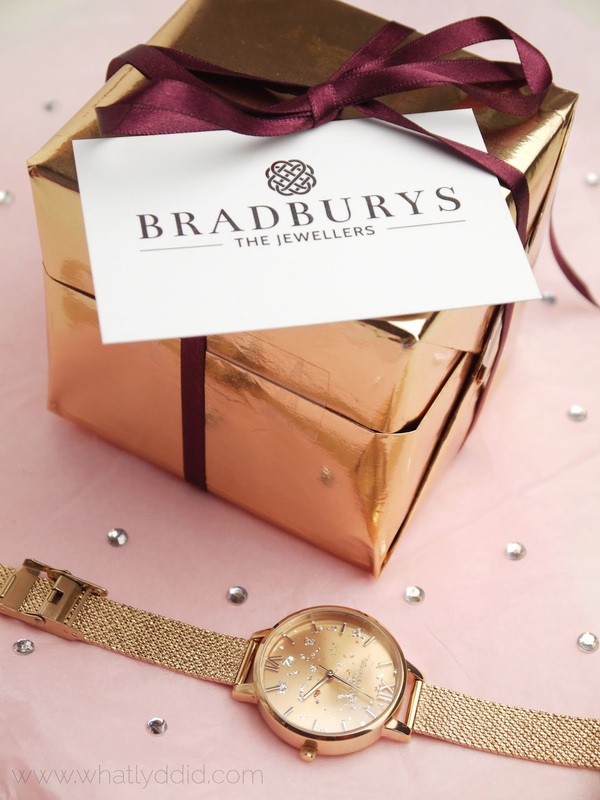 If you happen to be in Halifax pop into the boutique to be dazzled by their diamonds, or if online shopping is more your bag the friendly family team can help you find just the right gems from the comfort of your own home. What pieces of jewellery do you wear every day? *Watch was provided in exchange for honest review.